More than 12 years experience in projectors, provide 60-Day Return Policy, 1 YEAR Warranty and 24*7 friendly customer support for YOU. 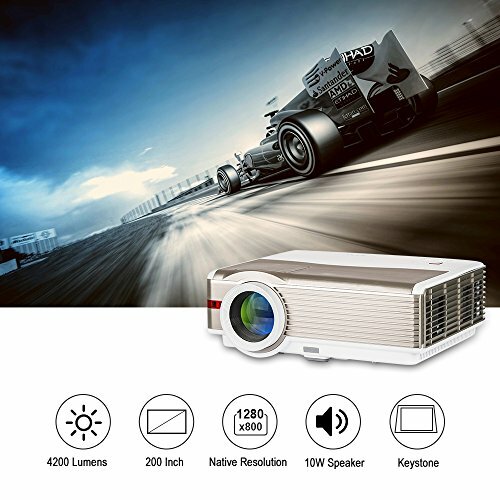 This projector is ideal for home entertainment, indoor or outdoor movies, videos, photos, xbox/ps3/ps4/wii u games, football games, tv shows, artwork projection etc, very suitable for family gatherings, birthday party, bbq, wedding, Christmas,Halloween,Thanksgiving party, outdoor camp, images tracing and other events. 1. How to connect my mobile device? ** If you use an iphone or ipad, you can use a Lightning to HDMI adapter to connect the HDMI cable we provide; for mhl-enabled android phone and tablet, you can use a MHL cable. 2. Can it be used daytime? ** The projector does best in the low light. For daytime use, if you can control the light well with curtains, it works. 3. Can I connect a Bluetooth speaker? ** There is 3.5mm audio jack for adding speaker. For Bluetooth speaker, you can use a Bluetooth transmitter. 4. Support file formats from USB? 1. USB direct playback, stream videos,audio,images,txt files from a USB flash drive/HDD without the need for a laptop/ PC. Dual HDMI inputs provide universal compatibility with all hdmi-out enabled devices, input signals support 480i, 576i, 480p, 1080i, 720p, 1080p. 2. Built in speaker: 10W, hook up external speakers via 3.5mm audio out port, connect to Bluetooth speaker using a 3.5mm headphone Bluetooth transmitter. Support Video:3GP, AVI, MKV, FLV, MOV, MP4, MPG, VOB, MPG, RMVB. Audio:MP3, WMA, ASF, OGG, AAC, WAV; Picture: JPEG, JPG, BMP. 3. Compatible with iPhone, iPad, Mac, Samsung, LG, Moto, Android phones, tablet, laptop/pc, dvd/blueray player, ps3/ps4, xbox, wii, pc/laptop, roku, firestick, cable box. System supports English, German, French, Spanish, Portuguese etc. 4. Front, Rear, Ceiling projection, native resolution: 1280*800, 4200 lumens, contrast ratio: 5000:1, bright and vivid for home theater viewing. Throw Distance: 6.56-19.68ft, Projection Size: 50-200 inches, Aspect Ratio: 16:9/ 4:3. Picture is adjustable with Vertical Keystone correction, Zoom in/ out and Lens focus.